A Big Discount for My Blog Readers for Holiday Cards and Prints! Ok, so you’ve done your family session for the holidays! Now what?? Well, get them printed of course! And don’t forget to get that holiday card made! While I offer really beautiful prints for clients through my pro lab, I realize there’s also a time and place for less expensive prints that are more economical for clients to use as gifts, etc. Also, I don’t offer products like holiday cards which I know are SO important for this time of year! So, for those things, I have teamed up with Parabo Press to offer a very special deal of 30% off ANYTHING on their site, for not just my clients, but ANYONE reading this post! It’s amazing and they’re such an awesome company with great products! I’ll be ordering my own holiday cards from them this year and can’t wait to get them! Then use the code KIN30 to get the 30% discount at checkout! Code expires December 13th, so get on it! 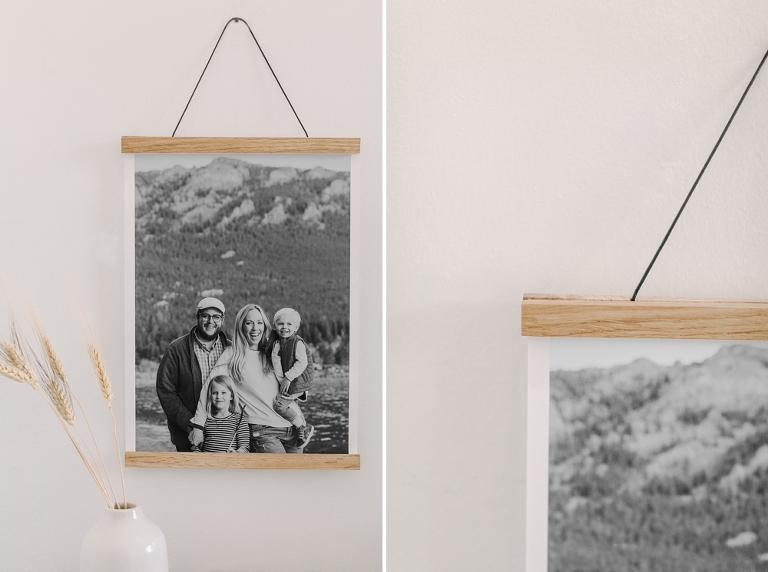 Parabo Press is the company that creates these wood rails to display multiple sizes of prints. This is a 12×17 print of a shot of my family from our recent trip to the mountains in Colorado.It was a dreamy mountain getaway and I love this print for reminding me how we all felt to be there! Check out this post from last year’s promotion to see the awesome and huge 30″x”40″ that still hangs above my mantle! The Colorado adventure was a big family trip, and I’m excited to give some of the photos we got in that magical place as holiday gifts this year! Happy Thanksgiving, everyone! And thank you to Parabo Press for another generous discount offer!